Since my Open Studio in October, my normal studio routine has been a little fractured. First came the huge job of putting my studio back together. 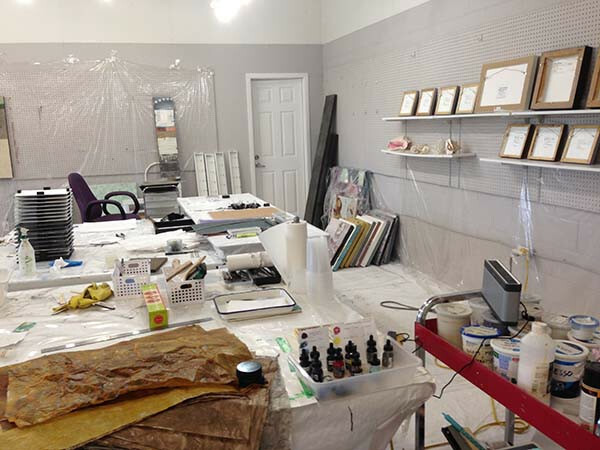 That involved laying white tarp on all the floors, covering the walls in clear plastic, putting back tables, carts and of course my paints and supplies. Oh, and my office too! I have SO MUCH STUFF !! It took a few weeks to get everything organized and ready to work again. Next while all this chaos was being sorted out, I was also showing work in four local exhibitions. SB Contemporary, Sho Gallery, Artcite and the Accelerator Pop Up. This involved lots of preparation and running around. In addition, I was honored to be invited to show in California in a curated group exhibit at Jen Tough Gallery. It opened January 5th and runs until February 13th. This is a wonderful gallery and I'm super grateful for the opportunity. But it did involve more preparation, shipping and travel time away from my studio. You can read more about the California show 'Learning Curve' below. In spite of everything pulling me around in various direction, I still managed to get to the studio most days. But it felt foreign to just dive into large paintings again. So I decided to loosen up with a series of small pieces on wood that had been gessoed some time ago. Instead of working on a particular theme, I gave myself permission to allow whatever came, to bubble to the surface automatically. What came out of it? Abstract Landscapes, Pattern, Texture, and stronger Values. Now, having warmed up, the larger canvases are again lined up and being worked on my painting wall. There will be more on these in a future post. Take a closer look at my little miniature gems. These tiny paintings create great focal points in small spaces. Interior designers like to combine several small artworks together in groups of two or more.